The LEGO Star Wars Yoda Minifigure Alarm Clock has been made to scale of a genuine LEGO Yoda minifigure. Yoda has moveable arms. The digital display lights up in red when you push down on the head, whether to make the alarm snooze for 5 minutes or just to check the time that gives you a 12 hour/24 hour option. 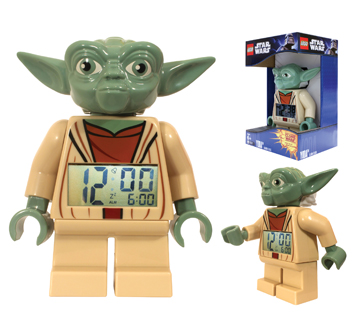 The Yoda Minifigure Alarm Clock has become a true collectible as it is one of America's best - known and loved characters as a bedroom accessory.